This is the first biography of Ethel Moorhead (1869-1955). She is known as a wild suffragette but few know the rest of her story. There can be few women who, in the early twentieth century, managed to lead such a varied and interesting life. She was short-sighted and a bit deaf, which may have been why her family regarded her as simply the stay-at-home, but her courage, her talents, her vibrant imagination mark her out as something much more. Annoying as she must have been, Ethel deserves her place in history. 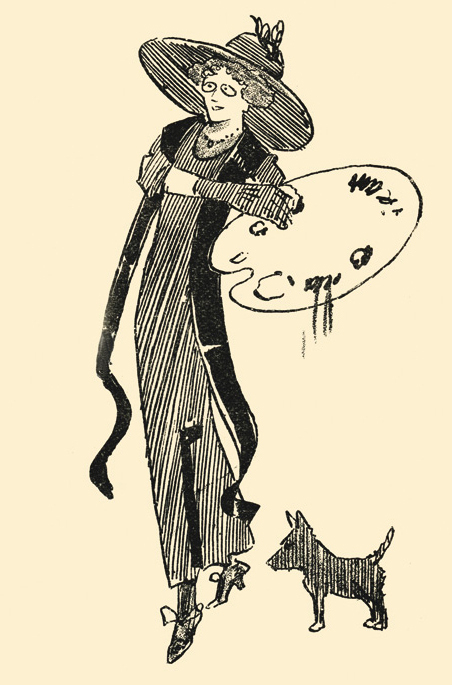 Ethel described herself as an artist. At thirty she studied in Paris at Whistler’s Academy, and began exhibiting at the Graphic Arts Association in Dundee. Her painting was highly praised and exhibited in prestigious galleries; unfortunately there are only a few black & white copies to be found. It was when her widowed father died that she launched out as Dundee’s – indeed Scotland’s – most ‘turbulent’ suffragette. She wrote in a very idiosyncratic style in her journal This Quarter about her early life, and especially about when she was a militant suffragist. Suffragettes were “the mad women”, “monoliths of black granite stalking along to crush a pagan temple” – and the male establishment was viciously (and humorously) attacked as “a house of puppets like unto the great House of Beelzebub”. Some newspaper reports of her activities are very funny, some (force-feeding) horrifying. The police found her in turn reasonable and certifiable. She was the first suffragette to be force-fed in Scotland. After 1914 Ethel painted, moving from place to place until, in the early 20s, she was to be found living in Paris and touring the south coast of France. There she met a young American to whom she became very attached. Together they co-edited This Quarter, a journal giving a platform for new and adventurous writing and art, including Joyce, Hemingway and Pound, Brancusi, Picabia and Man Ray. It was well regarded among the many small publications on the go at that time. A friend described an extremely volatile woman, capable of close relationships with her father, sister and best friend Fanny Parker (Kitchener’s niece) but capable also of alienating others in sudden outbursts. And then in the 50s her life all seems to have gone wrong. The only records are of a difficult old woman in black trying to scrounge money. She died at the age of 86 in a small Dublin nursing home and lies in an unmarked grave. Her death wasn’t even recorded until ten months later. Chapter 3. Votes for Women!